AMMONNEWS - French President Emmanuel Macron’s popularity has recovered to levels not seen since “yellow vest” protests broke out in mid-November as support for the movement wanes, a poll showed on Monday. The share of people who consider Macron a good president rose to 32 percent this month, where his popularity was when the protests first started, the Odoxa poll showed. His popularity has crept higher since hitting 27 percent – the lowest point so far in his presidency – in December as protesters rampaged through central Paris and other cities smashing windows and burning cars. Macron has faced the biggest challenge to his authority from the protests, which started over the high cost of living but spread into a broader movement against the 41-year-old former investment banker and his pro-business reform drive. The poll showed that 55 percent of those surveyed thought the protests should stop, the first time a clear majority was in favor of a halt since they began. The weekly demonstrations by protesters, named for the high visibility jackets French motorists are required to carry in their cars, have generally become smaller and less violent since a peak in December when the French capital saw some of the worst rioting, vandalism and looting in decades. However, numbers picked up slightly on Saturday with the Interior Ministry estimating that 46,600 people turned out nationwide for a 15th consecutive weekend of protests. Macron’s popularity has recovered as his government promised a firmer response to protesters’ violence and he launched a series of debates across the country aimed at reconnecting with voters, particularly in rural areas. 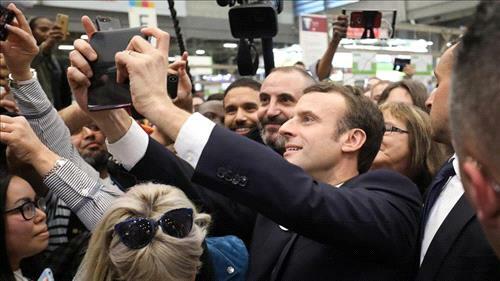 He received a mostly warm welcome on Saturday at an annual farm show in Paris, taking selfies with the public and chatting with farmers as he strolled for hours among the crowd and animals. That was a stark contrast to the previous year, when he was booed during his first visit as president to the farm show, an unmissable event for French politicians. The Odoxa poll was conducted on the internet on February 20-21 among 1,000 people for France Inter radio, Presse Regionale newspapers and L’Express magazine.